As an experienced knitter, sometimes I think I can't find new challenges or new techniques to learn. There was a time when anything besides a knit or purl stitch was intimidating. Now I've tried and mastered stranded color knitting, lace patterns, knitting in the round, even entrelac. That's why I was so excited to find the stitch block cowl from Purl Bee. 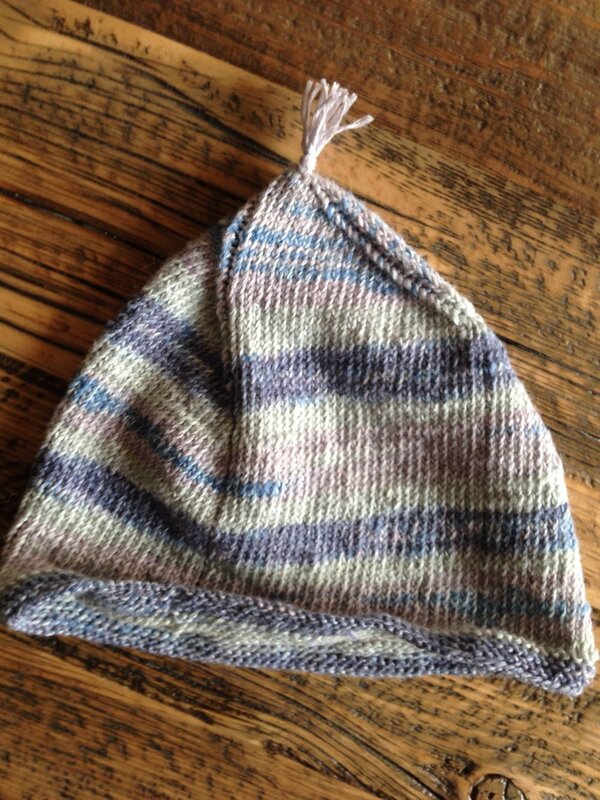 **Update-- Congrats to Kristin, the winner of the hat pattern! I love almost everything about fall. Pumpkins and squash. Football. Cooler weather. Sweatshirts, hats and scarves. But one thing I don't love is the sinus infection I get every fall. I consoled myself by purchasing a new knitting pattern so I had something to keep me busy while I sat on the couch between naps. Four days later I didn't have a sinus infection anymore (yay antibiotics! ), but I did have a new fall hat. I used the same yarn for this project that I used for the Herringbone Cowl -- Malabrigo Worsted in a color called Chapel Stone. The yarn is soft merino wool and shows off the pattern nicely. It's perfect for a hat because it's stretchy and makes a hat that fits snugly without being too tight. The pattern I used was the Kathleen Hat from Jane Richmond Designs. 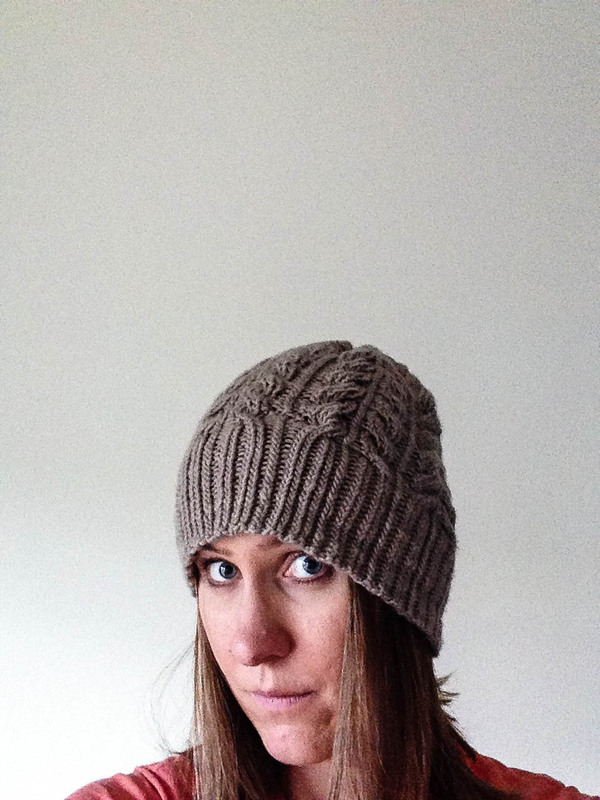 After I finished the hat, I loved it so much that I wanted to share it with my readers. Jane graciously offered to give away a free copy of the pattern to one of you! PS. I recommend checking out Jane's other patterns. She has some great designs for accessories and sweaters. The cables on this pattern aren't very hard and you'll memorize the pattern after a few rounds. We've had a really beautiful fall in Denver, but snow is in the forecast and I'm sure I'll be using this to keep warm this week. One of the best parts about this hat is that it goes with every outfit, it's warm and it doesn't mess up / flatten my hair. I love the cooler temperatures, the chance to pull out sweatshirts, fall foods (butternut squash, pumpkin pesto), football (how 'bout those Denver Broncos?) and rediscovering sweaters, boots and coats. Does anyone else out there feel like they regain 75% of their wardrobe when the weather cools down? Maybe it's just me since I live in Colorado, but I always get tired of my summer wardrobe. As summer was winding down, I started thinking about my next knitting project. Instead of baby clothes and blankets, I decided to make something cozy and warm for my apartment. When I started this blanket, it was hot and I could hardly knit without the AC on. But I finished it just in time. We're expecting our first winter storm tonight and some snow in Denver! This blanket is easy to knit mindlessly. It knits up really quickly. And it's perfect if you have a bunch of odd skeins lying around that you need to use up. I cleaned out my yarn collection when I moved this summer, so I bought 24 skeins of Knit Picks Comfy Worsted Yarn (Cotton). It's soft, machine washable and warm. What else could you ask for? *Just as a note, I didn't number the colors I used since this pattern is meant to be flexible. I switched to a new color whenever I ran out, but you could switch at the row ends for a more even look. I've answered a variety of comments below and you can read there for more tips from others who have made the pattern. I used the materials listed below, but the beauty of a blanket like this is that you can use any type of yarn. The amount you use will depend on how big you want your final product to be.? My blanket is 60 inches by 50 inches. It's not too big, but keeps me warm and is perfect for the couch. You'll always be knitting with two strands of yarn. I used one base color throughout and changed the contrasting color. 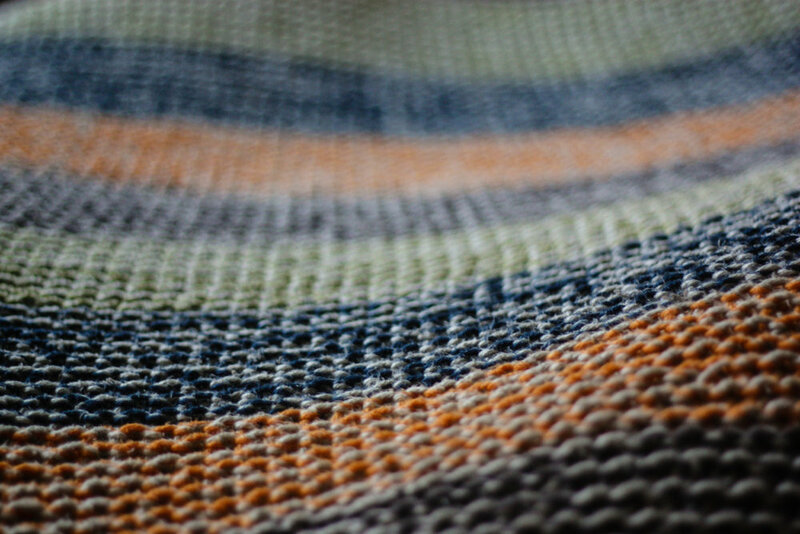 The blanket is simply garter stitch (all knit) with an I-cord edge. Cast on 130 stitches (or more or less). You can use any cast on method, but knitted or cable cast on work well here.? I attached the new yarn as the old skeins ran out so my rows are a little uneven. But that just adds to the charm. Hopefully I'll remember to close my balcony and windows tonight...last week I woke up and could see my breath inside! 4 year anniversary + giveaway! September 1st marks 4 years for me blogging here at Painting Lilies. I started this blog as a side project when I wasn't feeling challenged at work. I learned some basic coding, Wordpress and other skills to get my start. I didn't have a plan and didn't expect anyone other than my friends to read this blog. And at first, that's what happened. Friends and family read my posts. I took photos and knit blankets and cooked. Little by little I learned how to blog. I had fun working on my tiny space in the internet and blogging world. Eventually, more people started finding my posts. Google started picking up my popular ones. I started an email list. And sites like Pinterest, Ravelry, StumbleUpon, Craftsy and Craftgawker sent many of you my way. Now there are many more "strangers" who read than friends and acquaintances. I'm so glad that I've been able to provide patterns that you've used to make hand knit gifts for your friends and family. I love receiving pictures of what you're working on. I still read and reply to all my emails and blog comments. And it's still really exciting to get blog comments 4 years later. 4 of you will win all 4 of my paid knitting / crochet patterns (Tunisian Tweed Baby Blanket, Linear Cowl, Knobby Cowl and Sand Cable Blanket) I'm working on a new project right now. When that's done, you'll get that pattern for free, too. 5 free patterns! Leave a comment on this post and let me know what you're most excited about this fall. Pin this post on Pinterest and leave a comment with the link to your pin. Do both #1 and 2 for 2 entries. You have until the end of the day on Monday, September 2nd to enter. I'll choose a winner on Tuesday, September 3rd. Good luck and happy Labor Day Weekend to everyone! Sorry for the lack of posts here lately. I've been in the process of moving and all my cooking and knitting supplies have been packed away for the last few weeks. I've been living on green smoothies and quesadillas with mango and avocado. And while those are two things I really love, I'm really excited to start cooking in my new kitchen now that everything is unpacked. But in the meantime, I have something really exciting to share with you! 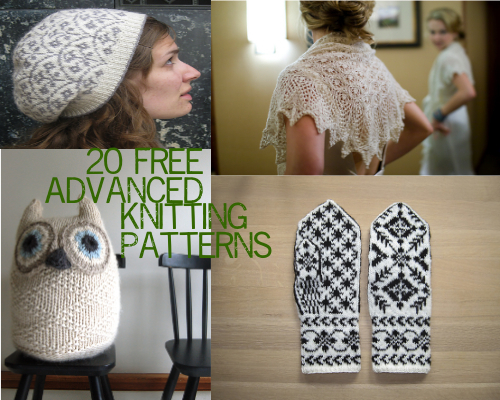 I know that many of you love finding new sources for free patterns. (Who doesn't?) So I wanted to let you know about a cool site I discovered a few months ago. Craftsy is an online community with free and paid patterns. They also offer online classes and sell supplies. You can find all sorts of patterns and classes for knitting, crochet, sewing, quilting, photography, cooking and more. I made my patterns (free and paid) available through Craftsy a few months ago and have seen quite a few downloads so it's a great place for those of you who also design patterns. 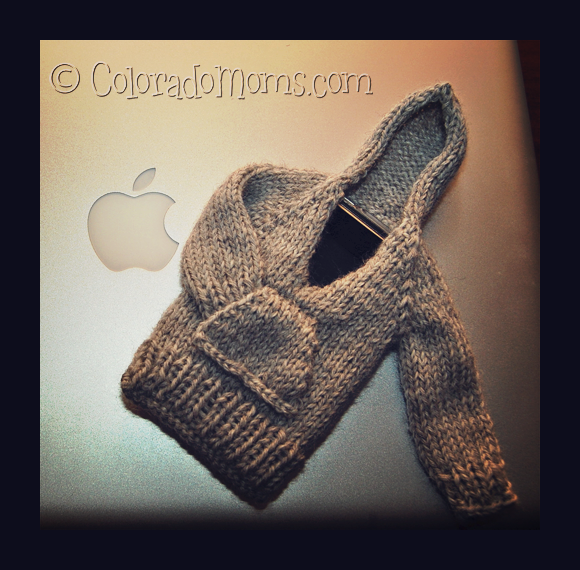 Knitting gifts is a labor of love. You spend time looking through hundreds of patterns to find just the right one. You put thought into the color and type of yarn. Once you have a plan, it can take weeks (sometimes months) to finish even a simple item. And that's if you don't have to rip out mistakes along the way. Because I put so much of myself into a handmade gift, I love making things for people who really appreciate them. I don't knit gifts for recognition or praise. I know that each person has a different way of saying thanks and a homemade gift isn't for everyone. But, it's really nice to know that someone appreciates the effort, that she uses the gift, that she knows you made it specifically with her in mind. That brings me to my latest knitting project. I made this baby blanket for my friend Ruth's (second) baby boy. He was born in March, so obviously I'm behind on my knitting. Ruth is one of the most enthusiastic recipients of my baby blankets. Her older son still uses his every night and it's his "blankie". She said it's one of her family's most treasured possessions and in a fire she'd grab her kids and their blankets. And you can't really ask for a better compliment than that! If you've been reading for a while, this pattern may be familiar to you. I made it a few years ago in grey and purple. The grey square in the middle is knit as a triangle by increasing and then decreasing. I love these patterns because they don't require casting on (and off) millions of stitches. After you make the grey square, you pick up stitches around the edge to work the lace pattern. 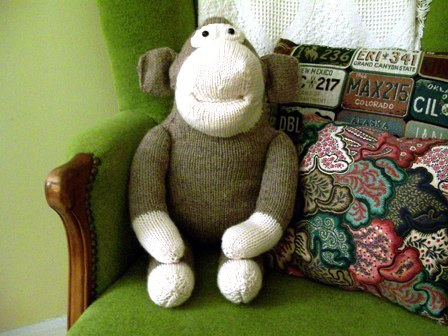 I used KnitPick's tweed wool again. It's super soft and not scratchy like most wool. The little guy might not get a lot of use out of it until the Fall, but it'll keep him nice and warm when the weather cools down. I bought the pattern for this blanket by Jared Flood. I love all Jared's designs (and those from Brooklyn Tweed)! This blanket was as fun to make the second time as it was the first. I've always enjoyed knitting cowls (here and here), but I have a few of my own and couldn't quite justify knitting yet another one. So when my friend Sally asked me to knit her a cowl, I was happy for an excuse to make another one. 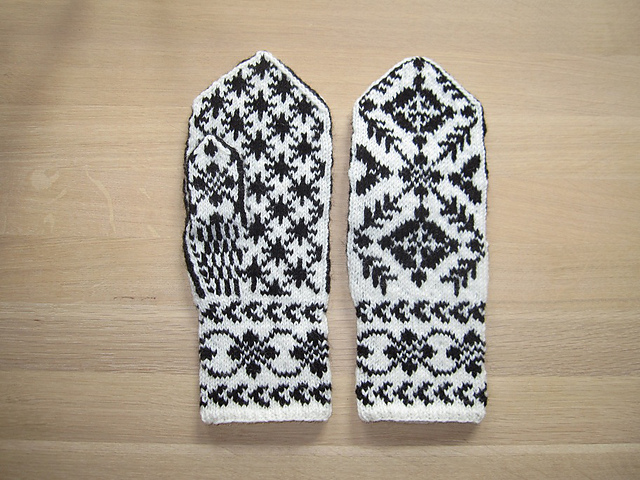 I started knitting some mittens with size 1 needles in the Fall. And so far I've completed 1 that's a little too small for me. I'll finish the other one eventually, but this cowl was a welcome distraction. I almost decided to keep this cowl for myself...the yarn is so soft! And I love the herringbone pattern. But I did mail it...I have an extra skein that I didn't use, so maybe I'll find something soft and cozy to make for myself. It took me a while to get the hang of the pattern, but once I did, it was fairly easy. That's not to say that I didn't make any mistakes. I had to go back and repair a few dropped stitches after I finished, but they weren't too visible. This pattern is hard to troubleshoot when you make a mistake. I didn't realize I had holes until I had finished it. The other mistake I made was when casting off. At first, I did it too lightly...then, I pulled the stitches too tightly, resulting in an uneven cast off. Instead of undoing it, I finished the cast off and then crocheted a border around it to hide the uneven border. Not ideal, but a decent solution. So not perfect, but functional and soft and a cool pattern. I used Malabrigo Merino Worsted Wool in a neutral color called Chapel Stone. You can find out all the details on Ravelry. Or check out the free pattern from The Purl Bee. Stay tuned for some more projects...I'll finish those mittens soon and I also have a baby blanket on my needles to post about soon! 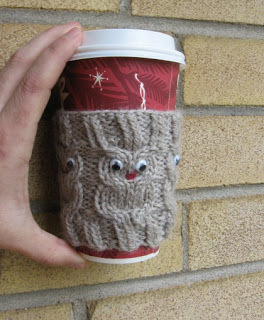 The thing about advanced knitting techniques is that they always seem intimidating until you try them. Once you learn the terminology to knit socks or how to manage multiple strings of yarn for color work, you wonder why you thought it was so hard. Here are 20 patterns that require some type of advanced skill. If you've never tried something beyond knit or purl, pick one of these lovely patterns and challenge yourself to learn something new! Do you ever wonder how days are declared official holidays or celebrations? Who decided to create Social Media Day or Flag Day or Bring Your Teddy Bear to School or Work Day? There's a whole website devoted to these special days...some are fairly well known, like Earth Day. But then you have Morse Code Day, Hug a Plumber Day, No Housework Day, Vitamin C Day. Today happens to be I Love Yarn Day. Even though I think all of these special days are fairly ridiculous, I do love yarn so I thought I'd post a list of some of my favorites here to commemorate the very special day (sarcasm implied). KnitPicks is a great place to find affordable yarn made from real fibers. They have a great color selection, too. One of my favorite yarns from KnitPicks is Shine. If you've ever felt the softness of Modal, you know why. This yarn is so soft and perfect for making baby items, snuggly blankets and other projects that you want to touch. It's also easy to work and displays patterns well. Cotton-Ease is my favorite synthetic blend. The colors are amazing. 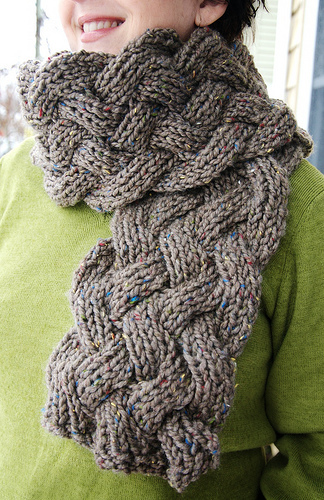 It's also a perfect yarn to show patterns. This yarn is durable and will work well for projects that need to be washed often. You won't feel like you're using a synthetic blend. This yarn has all the feel of real cotton. This yarn is a great go-to for wool. It works well for a variety of projects because it's a really strong fiber. 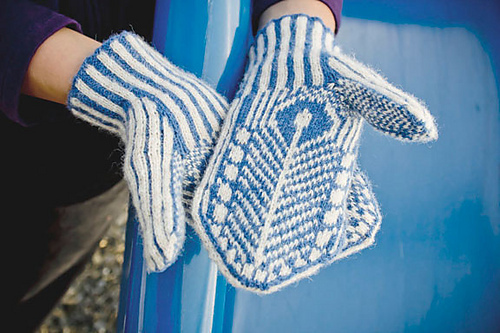 Make accessories like gloves and hats or use it for a durable wool blanket. The yarn drapes really well after blocking. If you need a durable yarn made from cotton, this is your solution. It comes in all sorts of colors and is great for household items like dishcloths, potholders, rugs, etc. Oh my. I love this yarn. It works perfectly for projects that require color work. It drapes perfectly. It's delightful. Did I mention the colors are beautiful, too? Buy a pattern from Brooklyn Tweed and make it with this yarn. You won't regret it. My favorite thing about MadelineTosh yarns is the lovely selection of colors. The yarn comes in all sorts of weights and fibers, but one I really like is Tosh Merino. I made a cowl in this pattern that I never want to take off in the winter. It's soft, cozy and warm. And somehow it's squishy, too. The color selection is extensive and will leave you wanting to by skeins and skeins. This is a totally different type of cotton yarn. It's soft and easy to use and has a smooth finish to it. Because it's so smooth and even, the yarn looks perfect for any stitch pattern. How about you? What's your favorite yarn?